Defence Minister AK Antony today backed the Army�s stand on the Armed Forces Special Powers Act (AFSPA) in Jammu and Kashmir. He made it clear that the unified command in Jammu and Kashmir would decide which areas can be removed from under the purview of the AFSPA. Exposing chinks in the police security of late Punjab Chief Minister Beant Singh�s assassins, a group of right wing activists today attacked dreaded Babbar Khalsa International (BKI) terrorist Jagtar Singh Hawara on the premises of the district courts in Sector 17 here. Beleaguered Kingfisher Airlines today sought a government bailout on a day when its shares crashed to a record low amid continuing debt fears, as it cancelled more flights for the fifth straight day, with 40 flights being cancelled. 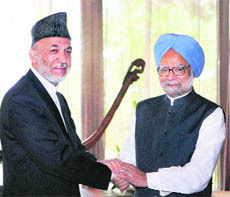 Prime Minister Manmohan Singh today met Afghan President Hamid Karzai and is understood to have discussed with him the regional situation, particularly in the war-torn country. Ahead of the crucial winter session of Parliament, the BJP today signalled that it would corner the government on the certificate Prime Minister Manmohan Singh yesterday issued to his Pakistani counterpart in Maldives, calling the latter a �man of peace�. Nearly 10 lakh people of Indian origin in Canada, a majority of whom are Punjabis, will soon get a compact social security cover in their host country. After months of thorny negotiations, India and Canada have finalised a social security pact which would be signed soon. Officials in the Overseas Indian Affairs Ministry said New Delhi wanted to sign the accord at the earliest. In a bonanza to millions of small savers, the government today increased interest rates on deposit schemes offered by post offices, like savings account, Monthly Income Scheme (MIS) and Public Provident Fund (PPF). While post office savings accounts will fetch 4% interest, up from 3.5%, the MIS and the PPF will earn an interest of 8.2% and 8.6%, respectively, a government release said.